On June 30, 2009, I wrote a post entitled "Chinese Typewriter". It's time now to do an update, because on March 9, 2011, I travelled to the University of Kansas to deliver the Wallace Johnson Memorial Lecture. So what do Wallace Johnson and the University of Kansas have to do with Chinese typewriters? It's simply that Wallace Johnson is the only Westerner I know who became proficient in the use of the kind of Chinese typewriter I wrote about in my 2009 post, and he happened to teach Chinese history at the University of Kansas from 1965 to 2007. I knew Wally Johnson because of his interest in Tang period law and because he received his Ph.D. from the University of Pennsylvania under Derk Bodde, who was a good friend of mine. When I went to Lawrence, Kansas last month to deliver a lecture in memory of Wally, aside from various scholarly and collegial activities, I was privileged to see the original rules for basketball written by Dr. James Naismith, which had recently been purchased for $4.3 million on behalf of the University by an alumnus, and I was greatly honored to see Wally Johnson's Chinese typewriter. The typewriter is kept in the office of Vickie Fu Doll, Chinese and Korean Studies Librarian in the East Asian Library of the University. When I arrived at her office, Vickie had brought out the typewriter and its many parts. She had them all laid out on a large library table. Let me tell you: I was in Chinese typewriter heaven! Vickie told me that I was the first person to type with Wally's typewriter since 1982 and added, "I don't expect any others to use it very soon." As you can see, the typewriter is extremely complicated and cumbersome. The main tray — which is like a typesetter's font of lead type — has about two thousand of the most frequent characters. Two thousand characters are not nearly enough for literary and scholarly purposes, so there are also a number of supplementary trays from which less frequent characters may be retrieved when necessary. What is even more intimidating about a Chinese typewriter is that the characters as seen by the typist are backwards and upside down! Add to this challenging orientation the fact that the pieces of type are tiny and all of a single metallic shade, it becomes a maddening task to find the right character. But that is not all, since there is also the problem of the principle (or lack thereof) upon which the characters are ordered in the tray. By radical? By total stroke count? Both of these methods would result in numerous characters under the same heading. By rough frequency? By telegraph code? Unfortunately, nobody seems to have thought to use the easiest and most user-friendly method of arranging the characters according to their pronunciation. I consider these photos (probably taken in the late 1970s) to be classics, since they vividly convey the suffering that is naturally associated with using a Chinese typewriter. Wally's body language speaks volumes. And you'll note that he had his tools and diagrams handy. 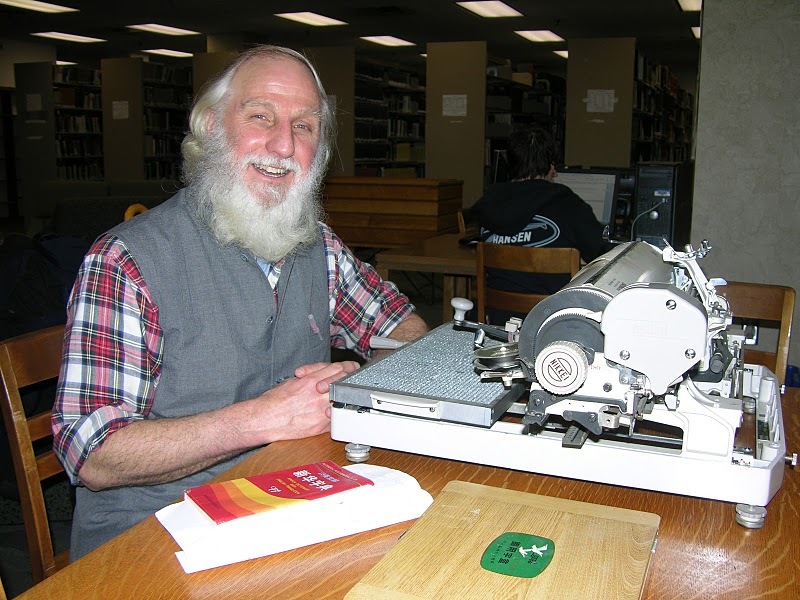 Wally used that machine to type a number of books, including one edited by my wife Li-ching and me, An Advanced Reader in Chinese Literature (1978; see the preface). He was assisted in the typing of this and three other readers by Violetta Wong and Stella Ting. Here's a more advanced, electric version of the Chinese typewriter in action (note the posture of the Japanese typist, which is somewhat reminiscent of Wally's in front of his typewriter). There's also a Tom Selleck TV Pilot, entitled "The Chinese Typewriter" (1979), but I have no idea why it is called that. Even though electronic devices have made it easier for typists to input Chinese characters nowadays, especially with Pinyin (romanization), the sheer complexity of the script ensures that anyone who types in Chinese will have plenty of Wallace Johnson moments. I've known for years a group of Anglican people who adopted as our special patron Bishop Samuel Schereschewsky, who spent many years typing a translation of the Bible into Wenli. I imagine that his typewriter might have been like the one you had the chance to use. Are you aware of any photos of the sort of machine he would have used? I was familiar with the Chinese typewriters and had many typist friends while working as a Chinese translator at the UN Headquarter in New York. The reversed image types and the sheer number of them made me feel sick and that I would never been able to use such a Chinese typewriter. I simply avoided thinking about Chinese typewriters and never asked my typist friends to disclose their experiences on learning and using them. Although modern Pinyin input approach has made the computer input of Chinese much easier, but I think the unwieldy Chinese writing system continues to bog down the Chinese intellectual efforts as if their minds are bounded by the cloth that used to bind Chinese women' s feet. My guess is that Schereschewsky wrote his Bible translation into Wenli (Classical Chinese) out by hand, and that it was then later type set. I'm fairly sure there weren't Chinese typewriters when he was doing his Bible translation. By the way, I also remember Chinese typewriters like those pictured above from my early years in Taiwan and mainland China, thought admit I never learned to use one. Good grief! To use one of those things, you'd really have to mean it. Didn't Lin Yu Tang work on developing a Chinese language typewriter as well? There is no Chinese dialect called Wenli, as far as I know. There is Wenyan or Wenyanwen, which means classical Chinese, or literary Chinese. I saw the Chinese typewriter being used by a secretary at National Taiwan University in the 1950s. It was very slow. I wondered how she could ever find a character on it. This is the first time I've seen a picture of you — that's an awesome beard. @Chris: The beard and mane were all shaved off on Friday, April 15, 2011. They had been growing for just a little over a year (from March 27, 2010) — the only time in my life I had ever seriously grown a beard. It wasn't a happy beard; rather it was a sad beard of penance and mourning. But a great beard nonetheless. Very interesting article; I went to the Lin Yutang House when I was in Taipei a few years ago, and I have to say, they (unsurprisingly, I guess) made the typewriter sound a lot more viable when they introduced it. P.S. Professor Mair: All the talk of input systems in Typewriter, Pt 1 made me look up 搜狗; unfortunately it's a Windows-only system, but while I was on their web site I stumbled across this gem: http://pinyin.sogou.com/dict/. Among many other things, it offers charts of trending words and phrases. As you might expect, many of them are proper nouns – new movies and TV series – but there are also newly-created/popular words and phrases, like "伤不起" and "有木有." Thought it might be interesting to you and the visitors to this blog. Interesting commentary. Tack så mycket! He says that the type is arranged so that all characters having to do with water, for example, are found in one row. Also that if you spill the type tray it takes several days to sort it out. 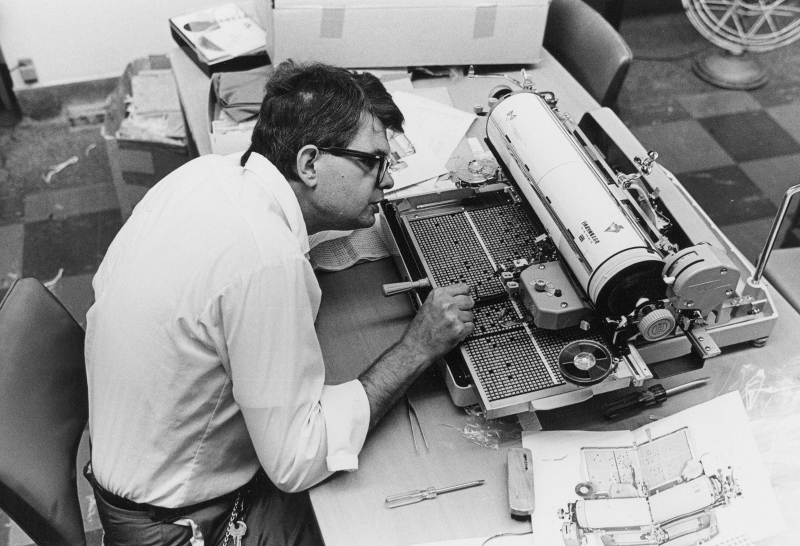 @ Tom Mullaney: I certainly do not think that the Chinese typewriter was a mere curiosity! Far from it, I believe that the history and nature of the Chinese typewriter are deeply revealing, and that is why I have devoted so much time to them. The comments of Apollo Wu and many others also need to be taken into account when one contemplates the ultimate significance of the Chinese typewriter. plus it bankrupted him and never went into production. Reading this makes me recall my own Chinese typewriter which I had bought for about US$100 here in Hong Kong in 1980. After carrying out the tedious, time-consuming task of rearranging all the lead type according to the pronunciations of the characters, I typed up my research questionaire and various other research instruments in conjunction with my Ph.D. research. In fall 1981 I packed up and shipped back to San Francisco this very heavy, cumbersome, and unwieldy machine in its own wooden crate, and then used it again in writing my Ph.D. dissertation. 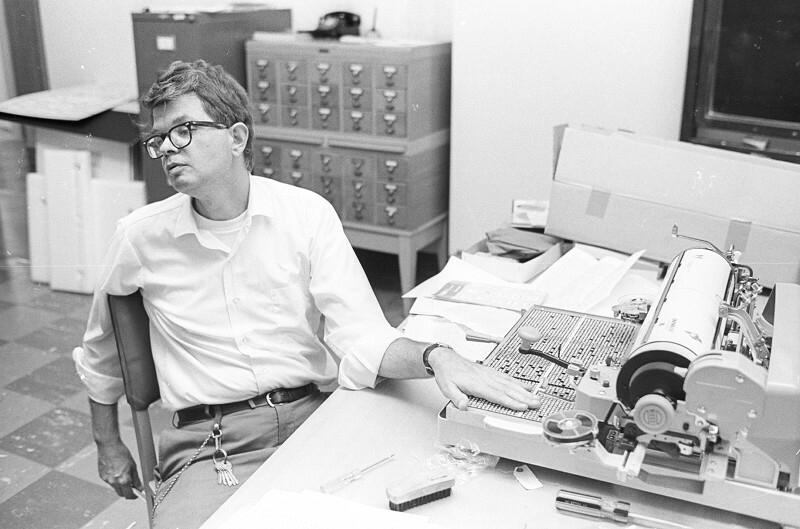 Just before I moved back over here in mid-1982 I put my Chinese typewriter in Jim Matisoff's office at UC-Berkeley where it remained for a while. At the time I thought it belonged in a museum, and I have no idea now where it finally ended up. I also remember when I was teaching at Wuhan University in 1984 that I saw Chinese typewriters being put to serious use in various offices around the university campus. Finally, as I recall, when we first met which was at a conference in Canada in 1986, you told me you had read my article "The Chinese typewriter and a phonetic rearrangement of the type tray" published in 1984 in the Journal of the Chinese Language Teachers' Association, XIX.2:129-143. A similar typewriter, one made in Japan, is on display at the Department of Asian Studies at Cornell. It is the machine Harold Shadick used to produce his Classical Chinese primer. The Journal of Asian Studies was published at U of Miami for some years in the early 1970s, and UM had a Chinese typewriter to aid in the editorial work. Someone showed me how to use it—great fun. But much, much nicer to have Chinese and Japanese software on my computer, available with a few keystrokes. @minus273 – The electric version, and quite possibly the manual version, would make producing carbon copies significantly easier. That seems to be about the only advantage I could see, unless the electric version has some sort of memory, so you could type stock phrases/addresses/etc over and over. On the other hand, organizing the type in what sounds to be the Chinese equivalent of QWERTY seems to limit its usefulness. I'm surprised that none of the devices pictured here have magnifying reticules — I'm sure familiar characters could be found almost by feel, but all the same it seems like making sure the correct tiny piece of type is in the target would be a terrible strain on the typist's eyes over time. Even though it was a sad beard, Victor, it was a handsome one. I'm glad it's been documented here for posterity. The typewriter seems excruciating. I think I would have preferred lining up and locking in individual characters on wooden blocks: that would at least have allowed bigger muscle movements! I find it to be brilliant, but not fully compatible with OS X, so I keep the native input method for backup. As to the arrangement of the characters on the Chinese typewriter, I suspect that the early machines (Dr Sheffield in Shandong ) and the later production models at the Commercial Press in Shanghai (Zhou Houkun 周厚坤, 1915; also others in Tokyo at about this time) may have followed the system developed by William Gamble (1830–86; no relation to Sydney D. Gamble), the inventor of the electrotype process for Chinese matrices, who also conducted the first ever systematic frequency counts of Chinese characters. It would be interesting if others could correct my supposition regarding the arrangement of the characters on the early Chinese typewriters. You will recall that Gamble eventually arrived at a total of 6,000 different characters (subsequently, this was increased to 6,664). Leaving aside the 3,715 characters that occurred less than 25 times, he arranged the remaining 2,285 in 15 type-cases for compositors with the characters arranged in sets according to their frequency and Kangxi classifier. The type cases were stacked in front of the compositor like the keys and stops of an organ console, all within arm’s length, so they could be pulled out as needed. Less frequently used characters were arranged to the sides. The result was that composition could be done much more quickly than previously. This method of typesetting remained in use for the next 100 years. I recall visiting the typesetting room of the People’s Daily in 1965 and marveling at the speed with which the compositors selected the right character from the banked type-cases in front of them. One sign of the times was that the most common clichés, such as yi fen wei er 一分为二 (one splits into two), youhong youzhuan 又红又专 (both red and expert), Xue Lei Feng 學雷鋒 (Study Lei Feng), Nongye xue Dazhai 农业学大寨 (in agriculture learn from Dazhai), or Gongye xue Daqing 工业学大庆 (in industry learn from Daqing), were already set up, each in a single lump of leaden type and arrayed in a special tray in front of the compositor. I think organizing a Chinese typewriter by pronunciation makes a lot of sense. Did Professor Johnson rearrange the characters? I'd love to see pictures of the actual layout when the typewriter came out of the box. Did people use tables which listed what row/column a character was on? Or did you have to search for each character individually? When I visited Lin Yutang's house in Taipei last year I noticed that although Lin himself had invented a Chinese typewriter, when it came to adding Chinese characters to the manuscript of his dictionary he used a pencil. The rest of the entry was typed on a QWERTY manual typewriter. Thanks for a fascinating post and a great MC Hammer video. On the theme of western pop culture and Chinese typing, I saw the James Bond film Tomorrow Never Dies in the late 1990s. Learning Chinese in the 2000s, I always expected to run into something like the keyboard shown at 9.08 of this clip http://www.youtube.com/watch?v=SKM_2b3cfTU&feature=related but never did. I suspect it was made up for the film, but has anyone ever seen a keyboard like it? I hope it's clear what i've tried to say/ask (with my poor English). @小锣 When this film was made, there really were keyboards like that with radicals and other components of characters. You must remember that, since people began to try to input Chinese characters into computers, there have been thousands of different systems for doing so. What you see in the film is one such system. @kareemoff My beard just grew by itself; I didn't even think about it, except to know that it definitely was a sign of penance and mourning. After a year, the beard realized that it had been there long enough, so it came off. one of my students (a native speaker of Mandarin) recently told me that while pinyin is most common among her generation, especially for brief input (texting, etc) that most people who do digital text input for a living in China use Big5 and find it to be the most efficient. was this statement true, and does it say something more about the input system or about generational differences? A slight digression on Japanese typewriters. As a student in Japan in the early 1970's, I found that computers (mainframes) used the Roman alphabet – perhaps Japanese words in Romaji, but neither Japanese alphabet (kana) nor of course characters (kanji). But the printers of the day were all formed-character printers, like a typewriter in that sense. Japanese typewriters looked then as shown in the pictures above. In the 1980's, visiting a patent law firm there, word-processors and dot-matrix printers had arrived, and a lot of material was "typed" to be printed by a dot-matrix printer in Japanese (kanji and kana). But the Japanese Patent Office (JPO) would not accept wrod-processed/dot-matrix printed material – I can only assume because the resolution of the time, 24-pin maybe, was not clear enough for complex kanji – so patent applications and such were all still typed on a classic typewriter. With the advent of laser printers, the JPO would accept word-processed material, and typewriting became unnecessary. I suspect the same is true in other fields; and of course all computers use laser printers. [Parenthetically, now the JPO accepts – indeed prefers – direct computer input]. Lin Yutang's mechanical typewriter anticipated modern Chinese-character input methods, but because it was more expensive, sadly it was not a success on the market, and, in fact, the attempt to manufacture it was financially ruinous for the author. Around the same time, U.S. Patent 2,471,807 was issued to Yen Ti-Sheng for a slightly modified conventional typewriter which printed pseudo-characters with one of 62 radicals on the left-hand side, and Zhuyin Fuhao on the right-hand side. I've long thought that this principle would be applicable both to input methods and to script reform: retaining radicals in place of tone indication would at least allow transcription of character texts, and would allow nearly the simplicity of a pure phonetic system like Pinyin to be achieved while retaining a tie to traditional characters. My father passed away almost 20 years ago and the time has come for me to dispose of his Chinese typewriter. It has been sitting in the basement and I am not even sure if it still works. Does anyone know of an institution or individual who would be interested in acquiring this machine? It is available to anyone who is willing to pay to have it crated and shipped from Vermont.